Creating a project in Maven is made easy with Eclipse! In a previous article, we have discussed how to create simple maven project in eclipse. In this article, we will show you how to create a web project or application using maven in Eclipse IDE. Let me list out what are tools and technologies that I have used to create web project or application using maven in Eclipse IDE. 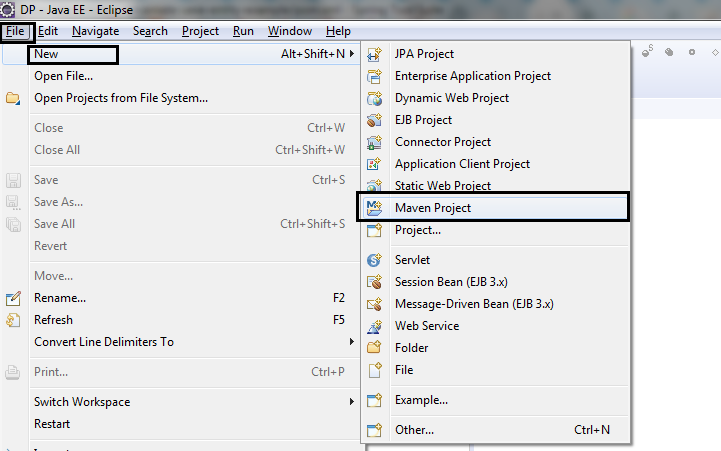 Let’s start step by step to create a web project using Maven in Eclipse IDE. Select the Maven archetype as maven-archetype-webapp and click on next. Provide the GroupId,ArtifactId, package and click on finish. And you are all set. You should see a new Project in Eclipse with the following structure. Now, let's test this web project by adding simple Servlet and deploy on tomcat server. Let's build the project using the following Maven command — mvn clean install. To execute this Maven command in Eclipse IDE, click on the Run menu → Run Configuration to create a new configuration. In the Run Configuration Wizard, double-click on Maven Build and provide the configuration information (Name, Base directory, and Goals) as shown in the below image. Now, click on the Run and monitor the output in the console. Next, let's deploy our web project into Tomcat. First, we need to configure the Tomcat server in Eclipse IDE via the server section. Once deployment is a success, then open a browser and type the http://localhost:8080/hello URL in the address bar. That's it! I hope you understood the flow of creating a web project using Maven in Eclipse. Let me know if you have any further questions in the comments section below!